"When in the course of human events..." began that unanimous Declaration of the thirteen united States, in Congress on July 4, 1776. We have, ever since, celebrated that date as being the birth date of our country (ignoring that the declaration was made on July 2, but recognizing instead its adoption on July 4). 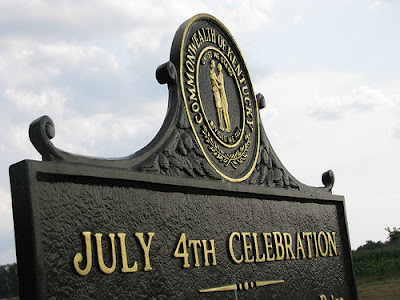 Today's celebrations are marked with parades, street fairs, and fireworks. Since 1777, Americans have recognized the importance of the holiday. The first such celebration in the West was in Jessamine County at the farm of Colonel William Price. Price, who had attained the rank of Major, preferred to be known as a Colonel likely due to his rank in the Kentucky militia. Col. Price was present in October 1781 for the surrender of Cornwallis at Yorktown and also saw action at the Battles of Brandywine, Monmouth, and Germantown. Fayette county, Ky., July 5, 1794. My Esteemed Friend -- I was greatly disappointed by your not coming to my house on yesterday (July 4). We had a glorious time and a big dinner. Forty men sat down at my tables, who had served in the late struggle for our freedom and independence. It was a glorious sight to behold, and I wish King George III and Lord North could have witnessed the scene in the wilds of America. On the return of this glorious birthday of our freedom from British despotism, the heart of every patriot in the late struggle may rightfully pour its highest tribute to God and the great sages and soldiers who resolved to stake their lives and sacred honor in maintaining the Declaration of Independence. Throughout the limits of our country, from Massachusetts to Georgia, the hears of a free and happy people have been dedicated on yesterday to the contemplation of the great blessings achieved and bequeathed to us by such heroic leaders as George Washington, Israel Putnam and Nathaniel Greene. Such brave leaders took their lives in their hands, and liberty or death was inscribed on their hearts. God, in the plenitude of His beneficence, has generally chosen men qualified to resist kings and tyrants in their attacks on the rights of the people. The history of our mother country furnished full proof of this fact and our own glorious country in the late war for independence is a more brilliant illustration o the great truth that God hates all tyrants and despotic rulers, and sooner or later overthrows all such rascalsin causing the people to rise up and cut their heads off. 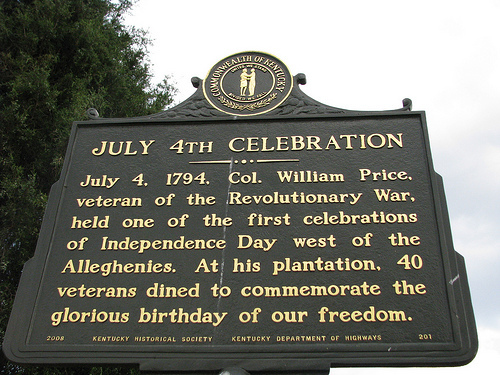 July 4, 1794, Col. William Price, veteran of the Revolutionary War, held the first celebration of Independence Day west of the Alleghenies. At his plantation, near here, forty veterans dined to commemorate the "glorious birthday of our freedom." Imagine the great time these veterans had with each having encountered different battles, different fronts. While some thought the war ended at Yorktown, the numbers included those who fought ten months later in the last major battle of the American Revolution which happened to occur in Kentucky: Blue Licks. Some suffered the frightful winter at Valley Forge and others were among Kentucky's earliest settlers. Each contributed greatly to our Nation's freedom and each reveled at Col. Price's home on July 4, 1794. Then, as now, together we stand but divided we fall.